in EUR to USD, USD to EUR. 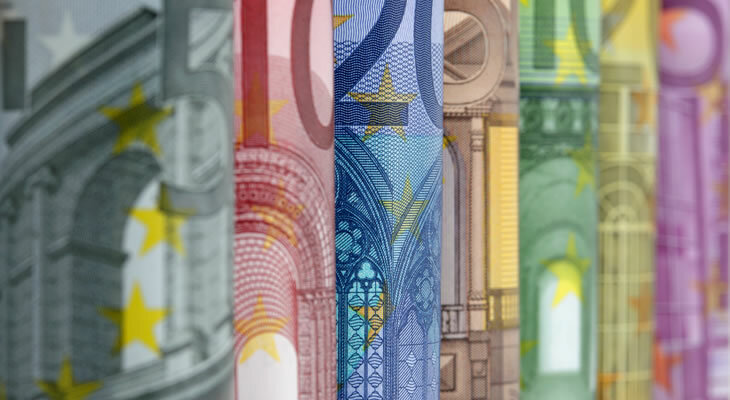 Confirmation that the Eurozone consumer price index had dipped from 1.4% to 1.3% in January prompted the Euro to US Dollar (EUR/USD) exchange rate to shed further ground. Markets were not encouraged by the reminder that inflationary pressure within the currency union is failing to pick up, as this gives the European Central Bank (ECB) further incentive to remain on hold. This disappointing result overshadowed better-than-forecast German economic data, largely negating the impact of a 2.7% jump in exports during the fourth quarter. While the Eurozone’s powerhouse economy continues to perform well a lingering sense of political risk still hangs over the domestic outlook at this juncture. As a result the appeal of the Euro (EUR) remained somewhat limited on Friday morning, the impact of January’s ECB meeting minutes having already dissipated. As investors continue to price in the odds of the Federal Reserve raising interest rates four times over the course of 2018 this has kept the EUR/USD exchange rate under some degree of pressure. While the Fed itself is yet to adjust its own forecasts to include a fourth possible rate hike markets are confident that the central bank will take a more aggressive approach in the coming months. This naturally supports the US Dollar (USD), especially as Thursday’s jobless claims data pointed towards a continued tightening of the labour market. However, if Fed policymakers take a less hawkish tone in upcoming comments this could prompt USD exchange rates to return to a general downtrend. Any disappointment from January’s advance goods trade balance or durable goods orders figures may also weigh down the US Dollar, with investors still holding some doubts over the outlook of the world’s largest economy. A rallying point could well be in store for the EUR/USD exchange rate, though, if February’s raft of Eurozone inflation data betters forecast. Any uptick in inflationary pressure here would go some way to reversing the impact of the weaker January readings, although it is unlikely to be enough to convince the ECB. On the other hand, if the consumer price index shows another decline on the month the EUR/USD exchange rate could extend its slump further. Unless there are signs of a sustained acceleration in Eurozone inflation the Euro may struggle to gain any particular upside momentum. Previous ArticleGBP/EUR Exchange Rate Advances, Italian Election to Dominate Euro Sentiment? Next ArticleGBP/AUD Exchange Rate Forecast; Will February Round of Markit PMIs Bring Bad News for UK Economy?